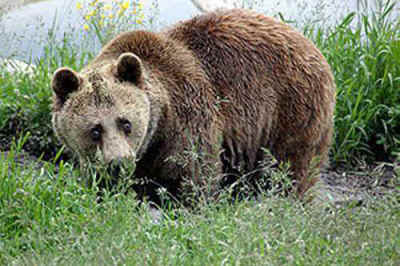 Dobri, a former dancing bear, was rescued in November 2003 and now lives in our Bulgarian bear sanctuary, Belitsa. As a result of his tortured past, poor Dobri was in a pitiful state when he came into our care. His left eye had been so badly injured during a trip to one of his ‘dance performances’ that he lost his sight in this eye. On top of this, he had no visibility in his right eye because of a cataract. It seemed that Dobri would spend the rest of his life in solitary darkness. However, at this year’s veterinary check-up Dobri had to be fully anaesthetized for dental treatment and eye specialists noticed an opportunity for him to regain some sight in his right eye. An operation like this had never been carried out on a bear! We decided to take a chance and give Dobri the opportunity to see again. On 18th September 2010, two of the best eye surgeons in Bulgaria, Dr. Tumbev and Dr. Dimkov, carried out the world’s first operation of its kind on a bear, together with the team of Professor Aminkov from the Veterinary University of Sofia. Despite his age, Dobri recovered from the operation remarkably well. After around 20 days, the stitches dissolved naturally. Sadly Dobri did not regain his full eyesight, as another severe wound was discovered during the operation, but he can distinguish light from darkness and make out shapes and outlines. This has made a world of difference to Dobri, improving his quality of life.